as my mind makes it out to be." Things and situations have no meaning when you're gone. Personal loving connections have long-lasting meaning. I have come to believe that life was meant to be fun, interesting and enjoyable. As I develop more inner peace and intentionally decide to enjoy myself, I feel more alive and more fulfilled at the same time. Eckhart Tolle said it clearly when he said, "What will be left of all the fearing and wanting associated with your problematic life situation that every day takes up most of your attention? A dash, one or two inches long, between the date of birth and date of death on your gravestone." It's interesting when people close to you pass away and any of the problems, even all of the problems that you ever dealt with them about are no longer of the least importance. In fact, if all of the problems from a lifetime with that person were put in a pile, it would not even be a millimeter high. What matters is the good times, the times you connected, when you were both present in the present moment. The rest is worthless. Yet at the time, we made such a big deal out of them, even to the point of fighting, arguing, maybe yelling, maybe saying things that you didn't really mean to say and more. For what? For a dash. Then if there might be any guilt being carried about, things we should have or could have but didn't, is all a bunch of feeling sorry for ourselves. It's our bruised ego trying to stay in charge. Yet, all that is now zero importance too. We just need to let go of that rope and allow love to fill us and that is the perfect cure. As we have issues in our daily lives, as the things seem to loom over our heads, we need to remember that it is our own thoughts that place the importance on them, and that we can choose to stay in the present, connect with each other, share love which is our natural being, and enjoy ourselves and each other. As important things go, this is as important as it gets. You Get To Choose What Is And Will Be Important To You. Spread Some Joy Today--Chill. Find something to put a deep smile on your face. Enjoy that moment. Savor it. is purely a fantasy of the mind." There isn't much space between judgment and justification. For most of us, as with me, we are taught a whole lot of ways to make judgement. Right and wrong, good and bad, plus and minus, positive and negative, and a thousand shades and variations on this theme. But the thing that has impressed me the most, is learning that all of these judgments are just opinions. It may be my opinion that I learned from an authority figure, or from books, or church, but it is just an opinion. We make a decision that something is this way or that, when in reality it just is and all the rest of the labels we give it are totally made up. In this respect, there is no such thing as right or wrong, good or bad, it just is what it is. Yet, when we label it and judge or justify as a result of our thinking of the label and what it means to us, that thing that just is will be turned into something much greater. Then we have a tendency to justify more by seeking people with very similar opinions or judgments. And, it doesn't matter how many ban together about the thing because it still is what it is, yet the fantasy of the thing continues to morph into something else. The truth is that we decide what is right and wrong and good and bad and everywhere in between. And we can change that thought any time we like and see a different perspective--perhaps even the opposite perspective than we had known. This fantasy of something being right and that people will all find it someday and know it as truth is far fetched. They will see whatever they see and decide whatever they will decide, while the thing is still the thing without any labels at all. Completely neutral. Carl Jung said that "everything that irritates us about others can lead us to an understanding of ourselves." This idea has helped me to consider my irritation when it exists and to examine myself, or my thinking about that to try to understand better what is really going on. Of course this goes both ways too. Sally Field said it well when she said, "It took me a long time not to judge myself through someone else's eyes." We can stand in judgement of others and we can also allow them to stand in judgment of us, and that is also often enough an interpretation based on not feeling good about ourselves. We also often use different standards. For example, Ian Percy said that, "we judge others by their behavior. We judge ourselves by our intentions." The ego sure doesn't like to be anything except above the crowd, and perfect in every way. I still judge people, things and events. I'm not certain that I will ever be completely free of it, and I mean this differently than discernment where I am making choices based on how I feel about something or someone. But, my awareness of this idea that right or wrong is just my opinion has helped me to tone down the righteousness and indignation, and even change my thinking mid-stream sometimes by reminding myself to pause and reflect a bit before passing judgment thoughtlessly, or by rote. I Have A Lot Of Opportunities To Make Better Choices. I Need The Practice. Spread Some Joy Today--by showing your own. It's unmistakable. "I sure hope things will change." I can, and I will. I begin today! Jim Rohn adds, "Don't say, "If I could, I would." Say, "If I can, I will." How many times have many of us said, "if only I could, I would?" The idea is that something is in the way stopping us, but it usually isn't that at all, but more like not being nearly interested enough, or not believing that it is really possible to do that thing we think we want. The truth is, when you think you can, you can, and when you decide you will, you will. Taking action always begins with thought. As Albert Einstein quipped, "the world as we have created it is a process of our thinking. It cannot be changed without changing our thinking." One of the biggest things I've learned about this whole idea of I can and I will is that I don't have to see the whole thing completed as much as having a willingness to enjoy the unfolding of it and see where it goes. Dr. Martin Luther King said that "we don't have to see the whole staircase to take the first step." Celebrate Your Ability, Willingness, And Activity. Spread Some Joy Today--Celebrate your ability and willingness to spread joy. Competition, Purple Cows, The Pie, and Cooperation. I don't believe in competition. It wouldn't matter much to me how many were in business in the same town with the same service or product. I know that there are a lot of people who don't agree with me and who do believe in the idea of competition, or the dog eat dog idea of survival of the fittest. After all, they claim, the pie is only so big and we gotta get our share before the other guy. We gotta focus on market share and we need more of the market share and all that baloney. If, as they claim, the pie is only so big, then it would be true that the only way for me to have more is to take it from someone else so they would have less. It's just mathematics at this point. I do believe in Purple Cows. Seth Godin wrote a wonderful book in 2002 called Purple Cow. Transform Your Business by Being Remarkable. It's not about stealing from others, it is about creating something remarkable that others will want. Fortunately, there are many ways to do that and it is only limited by ones creativity and desire. While some may focus here, all we have to do is focus there and that changes everything. I teach this exact thing in how to manage a great commercial truck department. It's about being remarkable and innovation. Also, rather than the idea of competition, I prefer cooperation. It's a foreign concept in the field I spent most of my life in. Car dealerships pretend to thrive on competition. I call it competing over the lowest gross profit, and they call it market share leadership. Yet, I have proven to myself many times over that by encouraging cooperation rather than competition, we all win. This brings me to The Pie. Competition believes the pie is limited and so the only way to increase your share of the pie, you must take market share from someone else, and the more you take, the more leadership you enjoy. Cooperation believes that the pie is not fixed and that it actually expands by virtue of cooperation. In this case, everyone can have more if they want it and they do not have to take anything from anyone else. I have instituted and promoted cooperation with other auto dealers, other body companies, other businesses since about 1979, and have grown stronger in my support of that idea from the massive successes I've had by practicing it. There are so many ways to do this, and help others at the same time. 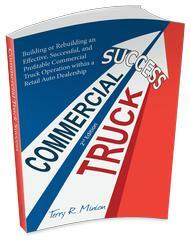 I worked for one truck body company and sold many so-called competitive makes at the same time by trying my best to help the end user get what they needed or my dealers get what they wanted for their clients. I didn't get paid directly for selling the competitive bodies, but in the long run, I benefited sufficiently by helping get the job done for my clients and their customers. That is cooperation--even if others don't actually cooperate, if you know what I mean by that. James Cash Penney (J.C. Penney to most), said it this way: "A merchant who approaches business with the idea of serving the public well has nothing to fear from the competition." I also like Franklin D. Roosevelt's quote: "Competition has been shown to be useful up to a certain point and no further, but cooperation, which is the thing we must strive for today, begins where competition leaves off." Spread Some Joy Today--Personal Thank You cards are old school. But they are so well received. "It's not just other people we need to forgive. For all the things we didn't do. All the things we should have done." Forgiveness is sublime, and it is not for others, but ourselves. I might add to Mitch Albom's quote above, all the things we did, and all the things we shouldn't have done. It's great to forgive ourselves for things we should have done but didn't do, yet is taken to a whole new level when we forgive ourselves for things we have actually done, yet have always regretted by feeling we shouldn't have done them. I think that if we are human, we err. If we are acting on impulse, eventually we will act in a way that in a time of more clarity, we would have made another choice. Maybe someone else was affected in the process, and that can add to the burden that we continually add to ourselves over time for these errors in judgment and/or action. Probably of all the things that I have learned to help me through life, the action of forgiveness of myself is high on the list of importance to me, and I have also been very successful in changing the way I have viewed past so-called errors, or mistakes. The thing that has helped me the most has been to put into a picture in my head what forgiving is. To me, regret and self-judgment is exactly like a game of tug-o-war where I am pulling with all my might against a foe or foes on the other side of the pit. It seems that the harder I pulled, the harder it was held firm. I could never seem to move the opponent enough to matter. The reason is that the opponent was me and is of equal strength. Essentially, I was fighting myself without any success. The change in me came when I realized that all I needed to do was let go of the rope. At first I thought that was quitting, and in a short time I realized that it was success instead. As soon as I let go, the opponent didn't fall down, but disappeared entirely, along with the rope and the pit. Now I use this strategy purposefully in many ways in my life, and mainly to forgive myself for those things I should have done, shouldn't have done, failed to do and did. Once I get some time as perspective, I often see that these things weren't mistakes at all, but an essential part of my journey. Forgiving others is a piece of cake to me. I just let go of the rope. As long as I am not forgiving them, I am at war with myself, and that war is no fun, and I find pain at every turn and negative thoughts that run in a circle over and over again. So, I've learned to just let go of the rope in my mind and the act of forgiveness has been achieved. I have released the issue, and I have at the same time, released myself from the self-imposed burden. Forgiving myself was not a piece of cake to me, but as I learned to let go of the rope and practiced it, felt it, I began forgiving myself more and more. Now it is easier. Sometimes one of those issues comes back from an old memory tape, and it is easier still because I have dealt with it before and know what to do. I have often found that letting go is the most powerful thing I can do. Spread Some Joy Today--by practicing letting go of the rope of the tug-o-wars going on in your life. That which is like unto itself, is drawn. that is unaffected by this powerful Law." The Law of Attraction is real. It doesn't matter if you believe it or not. It is. I began studying psychology, and self-help guru's back in the early 70s when I was in my twenties. I read all of Wayne Dyer's books, studied Transactional Analysis for several years, and many other authors such as Gerald Jampolsky, Dale Carnegie, Maxwell Maltz, Napoleon Hill, Shakti Gawain, Jim Rohn, and more. All of their information was helpful in one way or another, but it never really came together for me the way I had hoped. But, I continued to seek new information and new authors or ancient authors I was unfamiliar with. It was like a big puzzle on a table to me. I had lots of pieces and some fit together, but there were so many that were yet unmatched. Then, what seemed like coincidentally, I just happened to be in a Barnes & Noble in April of 2007, two and a half hours from my home while consulting with a client and I discovered the audiobook unabridged version of the book, The Secret. I had heard about it very briefly, and didn't know much about it, and thought I would give it a whirl. Since I was driving so much then, the audiobook was perfect. As I listened, it was as if all the other authors that I had studied seemed to meld into the idea of The Secret. On page three of The Secret, it is revealed as The Law of Attraction. Frankly, this was the first I've ever heard of this law. As the book progressed, it all became more clear to me. Then, I began studying the authors in The Secret and they filled in most of the blanks. Then I found out that Esther and Jerry Hicks were originally a part of The Secret video, but were removed, and I searched for their material and found the Mother Lode. It has become so clear to me after all these years of searching, and it makes perfect sense to me. I don't usually talk about "The Law of Attraction," much. Some think it is a bunch of hocus pocus, mambo jambo, fairy dust. But, it is one of those things that is called a Law because, like gravity, it doesn't matter whether you believe it exists or not, but if you step off a tall building, gravity will pull to toward the earth. However, believing it does have an advantage, and that advantage is to make good use of the knowledge to help yourself, and maybe others have a better, more fulfilling life. I don't try to convince people much. They need to come in their own good time. I've only known for 7 years now, yet it is as old as time. So, it took me almost a lifetime to open to it, or rather, attract it to me. I do try to explain it sometimes so that if someone is looking, they can find more information perhaps. What the Law of Attraction has done for me is to help me understand why so many of the same things were happening over and over again in my life. I was attracting them with my thinking. Once I began to understand this, I began to think differently and attract different things. I began to become grateful, more wise, able to see my actions and thoughts and how they worked together and so much more. To say that this teaching has changed my life is a severe understatement. It has changed it dramatically, and once changed, I cannot even imagine going back to where I was before. I am so blessed and grateful to have attracted it when I did. By Understanding The Law Of Attraction, I Must Accept Full Responsibility For My Thoughts, Actions, And Results. Spread Some Joy Today--by seeking joy for yourself. You can only give what you have. When I first saw this quote today, I thought, "gee, I could write a whole book on how many ways this applies in my life." My first thought was about business, and how sometimes people get to a point in a business where they try so hard to eliminate their weaknesses; e.g., cut all expenses. They seem to think that they can make a profit by cutting expenses, or eliminating weaknesses. Now, I agree that there are some things that can be temporarily curtailed, cuts can be made, but that is not the way to profit. The way to profit is to focus on the strengths and expand them. Cutting just makes you less than you were, whereas expanding your strengths makes you more than you were. Choose one: growth or death. In my personal expenses, I can cut for a while, tighten my belt, go without for a time, but the real answer is not this. It is to focus on my strengths and expand. Life is growth. Decline is death. I've been around so many businesses, many intimately, where they got on to an expense cutting tirade, which I call tripping over dollars to save nickles. If that energy were spent moving forward on our strengths--and I don't mean spending recklessly--the gains would make all the difference. It's not expenses, it is sales. Focusing on eliminating weaknesses, in our business and our personal lives is like standing still or going backward, whereas expanding our skills, our knowledge, our strengths is moving forward and growing. To some who might think that this is a trap of becoming obsessed with getting bigger. It isn't about getting bigger, it is about being alive and growing. You don't have to be bigger to grow. There are lots of ways to grow and expand; to become more than we were before. As long as I am living, I will be wanting more. This doesn't necessarily mean the same thing. It could be something different. It could be a change of careers, or any number of changes, but in all it is living, breathing, moving, and growing. Focus On Your Strengths. Expand Your Strengths. Become Even More Alive. Spread Some Joy Today--How can you help someone else find their strengths? It's a joy creator. When one is growing, becoming more, allowing more, a change in us sometimes isn't really noticed as something that has changed until a trigger via an event or some other thing happens to show us the change has been made. I had a trigger event today and it caused me to think about this. I was looking at some email, or link, and on this page I landed on there were some photos with links to other sites. One of them, as my memory allows recall, was a picture of a man, with the caption to see the 10 ugliest men in movies. There's a lot of those kind of things on YouTube. When I looked at the picture, my very first thought was that he wasn't ugly. My second thought was who is making this judgment? Then I started thinking of the idea of beauty vs. ugliness. Then I wrote down this note this morning: "Beauty is in the eyes of the beholder. Or it isn't." We've got this good/bad, love/hate, black/white, rich/poor, beautiful/ugly opposites comparison going on all over the place, all through our lives. It's taught in school, in church and every where else. But, I think that there is only good and the lack of good, love and the lack of love, black and the lack of black, rich and the lack of rich, beautiful and the lack of beautiful, and that we are the beholders of this or the lack of it. I did not recognize the face, but I certainly didn't think he was lacking beauty. He was unique. In fact, I thought he had a kind face with great features. But, those are my eyes. And, my eyes have become more clear and more allowing over time. I remember teachings about Jesus seeing your heart and knowing you from the inside and often wondered what that was like and how awesome that would be to sense that, and live that idea. Now I know better. Better than before. I've paused my immediate judgment just long enough to look deeper and see what I see with kinder eyes. Guess what happens then. I am filled with love. I even go around telling people that I love them as I look at them though most often I say it in my mind. Is it possible to love everyone? Well, I think that is in the beholder as well. Spread Some Joy Today--Look with a kinder, gentler sight.